Naz completed the Self Analysis Book Course and has this to say: "If one were to walk into the SoMa Mission with an empty tool belt and had only one book that they could read before going to Anarctica, I would suggest that they read Self Analysis and take it with them. This has been an incredibly intimate journey. With courage and an intense curiosity for what it was/is that I am composed of, I was able to come through the other side with a greater understanding of self - leading to a better ability to master self. It takes strength to read this book. Even more - it takes patience and dedication. But if there's anyone who is worth it and who has the most invested , it is YOU." "While reading one of the longest lists, I was having trouble thinking of instances to answer the question about recalling a time when I exerting my command over an object. Like a lightning bolt, a moment from my childhood when I played soccer rushed in. It was SO funny to me to remember the incident. Everthing was vivid. Every emotion was in the present. and right there in the course room for several minutes straight, I was having the most uncontrollable bout of laughter. I laughed so much that my eyes were watering and tears managed to escape down my cheek. Energy flooded my body and at roughly 9 PM at the end of a long and busy day, I felt a new rush of vigor. It was beyond great - AMAZING!" "It is a huge win to know that I can only get better from here on out - and up. No longer do I have the feeling of getting worse but now more understanding of my environment an, above all, myself!" * Straightwire: the name of a process. It is the act of stringing a line between present time and some incident in the past, and stringing that line directly and without any detours. 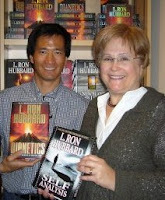 Ricky finished the Dianetics: The Modern Science of Mental Health Book and Lecture Course. His success: "This course allowed me to easily and fully understand the process of auditing a person's reactive mind so he can take hold of who he really is. The data has answered many of my own questions about the mind hence I now have greater confidence with myself and others. I highly recommend this course/book and lectures to anyone. I can personally guarantee a true understanding of oneself." 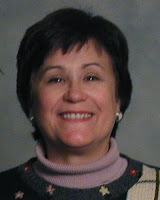 Carol completed the Self Analysis Book Course. She says, "The physical universe says 'force! force! force!' - Self Analysis gives a very different stable datum. Isn't it amazing that by reminding a person of his triumphs, his successes, times he has loved and communicated that old sorrows can drop away? I want everyone to have this data. I want a new understanding and reality shared that it is not hard to rehabilitate our friends, family and the world." "My understanding of how and why my purpose in life aligns with and in this universe is clearer and stronger than before. I feel very validated in my goals to create more theta. I feel more able to do it. And more able to see when I am accomplishing this goal and when I am not. I feel very peaceful and calm. We are creating a new reality on the Basics. It is a good one." Self Analysis book course - "I have had many wins with this course and I cannot wait to run all the self processing lists on myself several times. 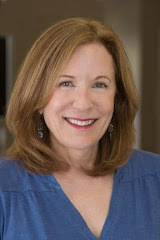 Those little moments when you felt so alive you wish you could bottle up the feeling and save it for later - but guess what - when you recall these moments with Self Analysis, they come back in full force like you opened up a magic container of fairy dust!" 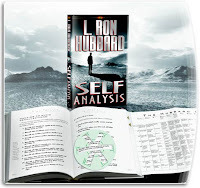 Another win from Self Analysis book course - "I had a lot of fun on this course. It has the best description of life and death that I have ever read. You cannot help but go uptone when reading through the lists. I don't know how many times I laughed out loud while reading the book!" 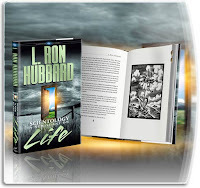 Science of Survival book course - "While reading about the life force and the material universe, I realized that what L. Ron Hubbard had discovered was that death is no longer needed to assuage life-time pain and loss. In Dianetics® we have the capability of handling all pain, all problems, while alive!!"